According to historical research performed at the University of California, Riverside, the majority of Riverside’s Chinese population arrived to work in the citrus groves that powered the development of the community. At the height of the season, as many as 3,000 Chinese laborers might be living in temporary housing in or near the groves, picking and packing fruit for a living. A second fire destroyed the new Chinatown in 1893 but it was rebuilt on the same site, this time with brick and wooden buildings, and featuring a small temple. Shops, laundries, a butcher, small restaurants, and residences, as well as services for migrant laborers characterized the community. It was against this background that 16-year-old Wong Ho Leun emigrated to Riverside to join his father, Wong Ben Chow or “Little Joe Wong.” Upon arrival he went to work as a houseboy for Stephen Herrick, a real estate developer and founder of the Iowa Syndicate which later became the East Riverside Land Company and East Riverside Water Company. Herrick’s wife gave the boy his American name, George. While a student, Wong Ho Leun was the Superintendent of the Chinese Mission School and taught English to the Chinese children. The school was located at 12th and Chestnut streets and was later relocated to Chinatown. 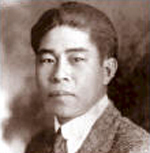 Wong attended Grant School, Poly High School (Class of 1923) and Riverside City College. He dropped out of college as the result of a narcotics selling scandal for which he was later exonerated. Wong had aspirations to become a lawyer and was politically connected with some of Riverside’s prominent families such as Judge Russell Waite and Mayor E.V. Dales (both at Evergreen). He worked as a cook for Frank Miller at the Mission Inn. By the 1930s, the Exclusion Act began to take its toll on Chinatown and numbers of Chinese in the area declined. Somewhat of a recluse, Wong lived alone on the Chinatown property, outbidding Evergreen cemetery for the 5-acre site at a court sale in 1941. After 1941, Wong built a restaurant called Bamboo Gardens in Chinatown and operated it for a few years. In 1961, the city of Riverside created a short street to connect Palm Avenue and Pine Street near the Chinatown area. The city Traffic Division consulted Wong to obtain the Chinese lettering to appear on one side of the street sign. The English side said Wong Way, and the Chinese characters say Wong Ho Leun Street, his full Chinese name. In 2009, city renamed the English side Wong Street. Wong was known for his collection of over 40 cars and his collection of Chinese antiques and artifacts, some of which were acquired by the Riverside Museum upon his death in 1974. George Wong was the last resident of Riverside’s deserted Chinatown. In 1984-85, archaeological test excavations were conducted and thousands of artifacts were uncovered and stored at the city museum. The unexcavated portion of the site contains the bulk of the Chinatown artifacts. Future plans for this City Landmark, County Landmark, State Point of Historical Interest, and National Register of Historic Places site are still being pursued by the Chinese community.